A report prepared by the Cumhuriyet daily has concluded that state-run Turkish Radio and Television Corporation (TRT) broadcast speeches by President Recep Tayyip Erdoğan and other Justice and Development Party (AKP) officials for a total of 4,113 minutes in the past 22 days. According to the report by Cumhuriyet reporter Mahmut Lıcalı, TRT had broadcast Erdoğan’s speeches for a total of 1,309 minutes from March 1 to March 22. 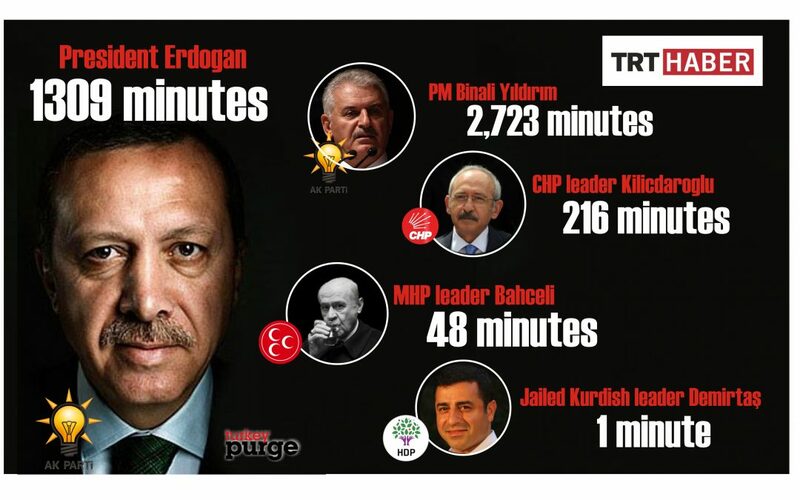 Prime Minister Binali Yıldırım and other AKP officials were given 2,723 minutes of airtime during the same period. The Republican People’s Party (CHP) was allocated 216 minutes, while the Nationalist Movement Party (MHP) was given 48 minutes, in total. The Peoples’ Democratic Party (HDP), on the other hand, received only 1 minute of airtime in pre-referendum broadcasts in the last 22 days. In January, Turkey’s Parliament passed constitutional amendments, later approved by Turkish President Erdoğan, that would transform the political order into an executive-style presidential system, effectively expanding the scope of power of the position. The ruling AKP, backed by the MHP, pushed through the legislation that President Erdoğan says will bring the strong leadership needed to prevent a return of the fragile coalition governments of the past. The CHP and pro-Kurdish HDP fear the reform will fuel authoritarianism. Parliament’s approval paved the way for a nationwide referendum on the amendments, which would give the president, a traditionally more ceremonial role, the power to dismiss ministers and Parliament, issue decrees, declare emergency rule and appoint figures to key positions, including the judiciary.